"My daughter was lying on the floor fighting to breathe and the moment I took her in my arms she was foaming at the mouth. I immediately rushed her to the nearest hospital and they turned me away saying that her condition is too critical to save. I was devastated. By the time I reached a bigger hospital, her breathing became heavier. I was lost and was crying for help. They immediately put her on ventilators and treated her. Doctors told that she needs a heart surgery. But I don’t know how to save my little one, I have nothing left to call my own except my children." - expressed Neelima with teary eyes, Dimpu’s mother. 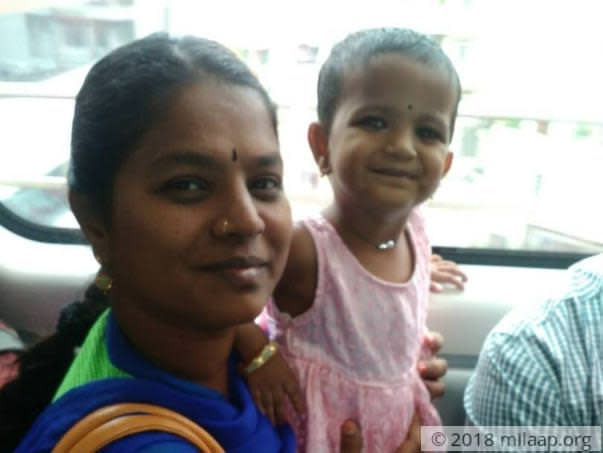 Neelima is a single mother of two children. On one hand, she manages the house and on the other, she works as a part-time lecturer in a college. With her minimal earnings, she is struggling to give her children a better life. Dimpu being the youngest and naughtiest child has always been a darling to her mother and her brother. “A year ago, my daughter fractured her right leg while playing. The doctor noticed that her toes were blue in color and asked me to immediately consult a cardiologist. I was worried so I immediately took her to a doctor, I was shocked when they told that she is suffering from a severe heart disease. They suggested me to wait until she turns 10 as her little body may not be ready for a major operation. 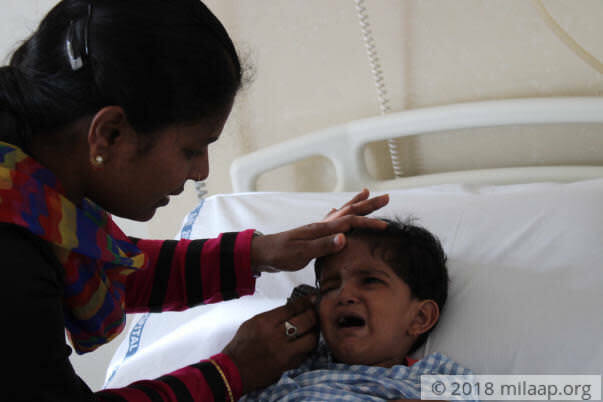 But fate has turned against my daughter and now she is on the brink of death at the age 4.” - Neelima. 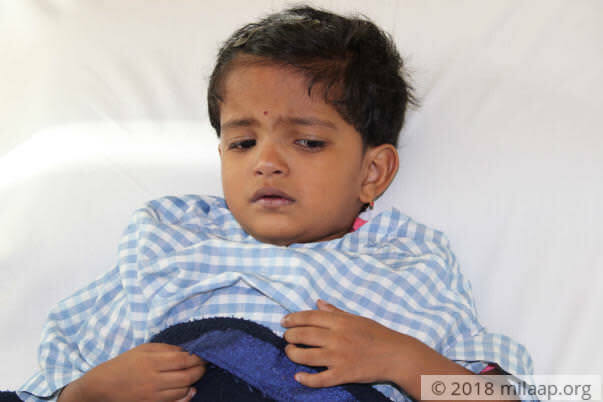 Dimpu is suffering from tetralogy of fallot with stenosis, a severe heart disease where a combination of four related heart defects occurs together due to which flow of blood from the heart to the lungs is gravely affected. This has also caused respiratory distress in this child. 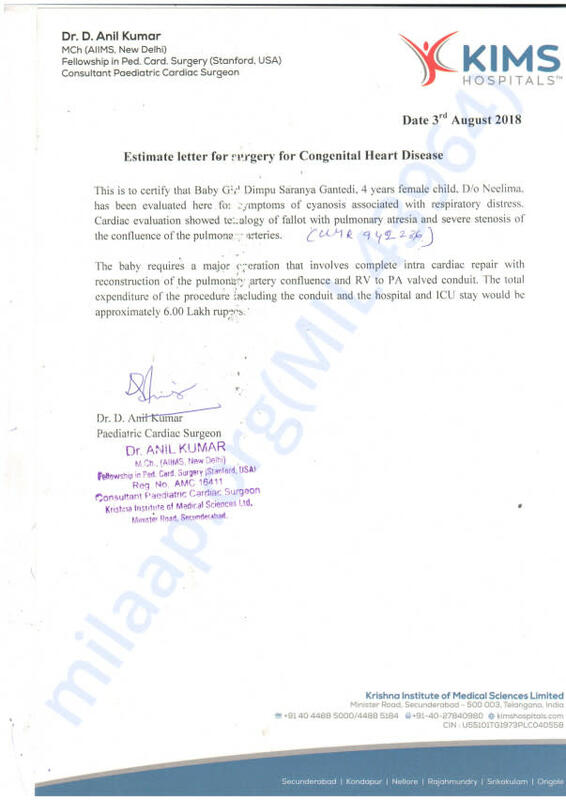 She urgently needs a surgery for reconstruction of the pulmonary artery to supply blood flow to the lungs without which she will not survive. After the treatment, she also needs to be admitted to the ICU for observation. “My daughter is unable to even gulp small bits of food. She stopped eating because a few seconds that take to chew and gulp the food is badly affecting her breathing. Very soon she goes out of breath and even if she widely opens her mouth to gasp air, the food in her mouth is blocking the way of air to the lungs. She has lost her weight drastically and my little one who was active and talkative is now quite with weakness. Doctors told that she is running out of time and needs a surgery immediately. Every passing second is terrifying and it is painful to live with the fear of losing my daughter.” - Neelima. Neelima is struggling all alone without any support to save her daughter from certain death. With the part-time job, she only earns Rs 7000 a month. With her little income, she is educating her children and running the house. Now she is overburdened with the expenses of the treatment and she is unable to afford the surgery that can help her daughter survive. "My children are the world to me. I am only living for them and I cannot imagine to survive without my lovely daughter. I have spent all my savings of the future on her tests and treatments. 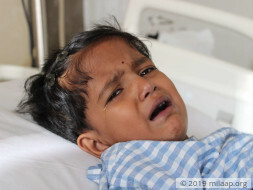 I have spent Rs 50,000 until now and need 6 lakhs for my child's surgery. I don’t have anything left to save her life. I have tried knocking on many doors but only returned hopeless. 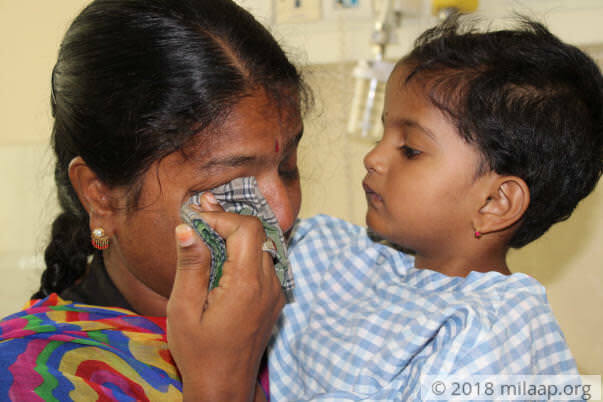 Now I am left with nothing but tears and prayers.” - Neelima. 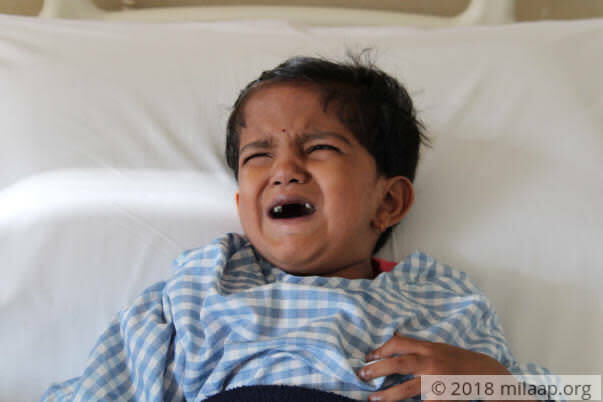 4-year-old Dimpu is suffering from a severe heart defect that gravely affected the blood flow from the heart to the lungs. It had also caused breathing difficulties. She urgently needs a major surgery which can help her survive. Dimpu is living on the brink of death and every passing day is only taking her closer to death. This single mother has exhausted all her saving and is now completely dependent on the crowdfunding to save the daughter. Your kind contribution will help Dimpu survive. Click here to save Dimpu. Dimpu is currently at home and is doing well. Here's a current photo of Dimpu. Thank you for the love and support you have shown towards Dimpu. We would like to inform you that with your support, the campaign raised excess funds and there is a 6 year old kid named Dhanush who required urgent heart surgery. 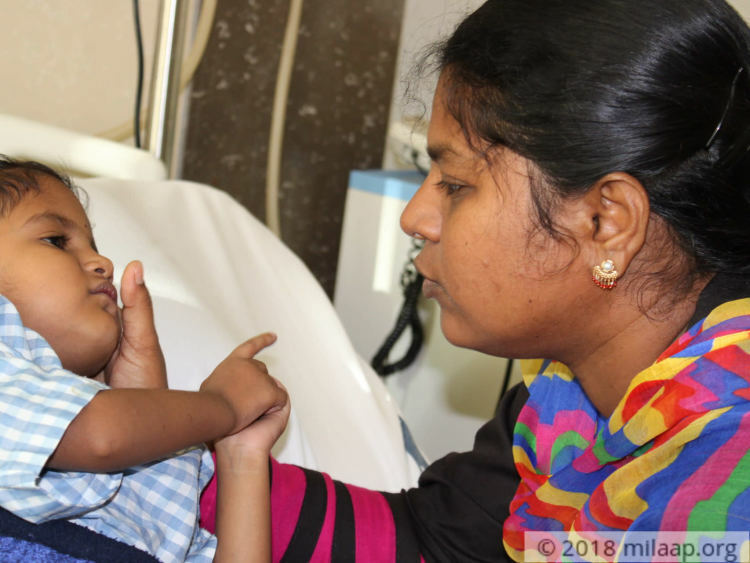 As per the discussion with the family and doctor, funds have been mapped towardshttps://milaap.org/fundraisers/support-k-dhanush to help him undergo the surgery at the earliest. We are happy to inform you that Dimpu has got discharged and is recovering well. She will be coming to the hospital for follow ups. We will keep you posted on the progress. Thank you so much for the support you have shown towards Dimpu so far. We could not have done this without your support. God bless her...hope all goes well.